Most 1stPayMobile Accounts are set up to batch out automatically. This means that you most likely will not need to take these steps, unless you run an Authorization rather than a sale. A Settle needs to be performed for any transaction that is entered as an 'Authorization'. (Read more about transaction types and running an Authorization here. The only difference between running an Authorization and a Sale is changing the Sale button in the top left to Authorization.) A Settle will send the transaction to a queue for settlement later that night. This is how the funds get moved from the cardholder's account to your bank account. Log into the 1stPayMobile App using your 4-digit Mobile PIN. Tap the 'History' icon and select 'Recent Transactions'. The search box will allow you to filter your results by last name, first name, date, last 4 of card, amount, or transaction type. For example, you can search by "Auth" to find Authorizations that need to be settled. 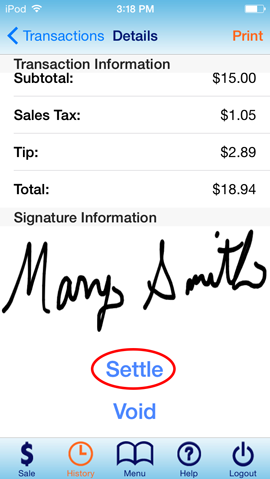 Locate your transaction and tap on it to view Transaction Detail. Scroll down and tap the 'Settle' button. Tap 'OK'. Please note: If a transaction has been settled, the Settle button will no longer appear in Transaction Detail.